It took me forever to finish this last Dune book. I think subconsciously I didn't want to finish it. The last chapter was painful to finish. The only way to quell that pang was to run out and buy a few more Herbert books (see below). Overall my book reading throughput dropped dramatically these last few months. I'm not sure what happened. But I've decided I need to hit at least 24 books (not including comics) this year as a way of keeping my reading up. Back to Chapterhouse. I've read a couple of reviews of this book and I'll touch on two points that come up frequently. Overall I liked the book. Dune and Heretics were my favorites. This one came in third or fourth. First, a lot of people felt it ended with a cliffhanger. Fair enough but this is Dune. Herbert's trying to create an imaginary world that seems real. The real world doesn't end like a fairy tale. I was thoroughly happy with the end. Bene Gesserit and Honored Matres end up in a compromise. It seems like the only solution in retrospect. And Sheena and the rest of her misfits 'scatter'. I do see on Brian Herbert's website (his son) that there were notes left by Frank for an seventh book and that Brian will write this as two books. I don't personally feel a need to have 'closure' on the Dune stories but I'll read them nonetheless. Second, what is up with that last chapter with Marty and Daniel. Crazy. I think the bulk of interpretations are correct - this is Frank and his wife Beverly discussing the world of Dune. "Gholas. He's welcome to them." 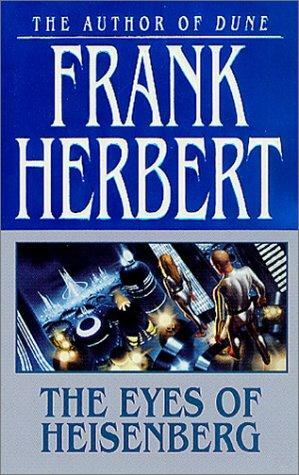 This is the first non-Dune books I've read by Herbert. It's an earlier work. After Dune but not long after. It is, from what I've read, closer in themes to most of his non-Dune books. It revolves around nature and chaos in the universe as a creative force and man's endless and futile pursuit in controlling it. In this case breeding is completely controlled to create a set of have's and have nots. It felt good to read. It's a quick read coming in at around 200 pages but it is so unmistakably Herbert. His writing style is so distinctive. It actually comes off as a lesser developed and a less mature work than Dune. There is something subtly dated about the work (the have's are referred to as the Optimen) whereas Dune seems like it could have been published yesterday. It was utterly satisfying nonetheless. I'll probably go back and visit the rest of his books at some point. In between both of those books I've been consuming a voracious amount of comics too. I've largely switched over to TPB (trade paperbacks) which are compilations of the weeklies or monthlies. It's cheaper and easier and takes a crapload less visits to the comic store. Anyway, Marvels is a interesting take on the Marvel universe of characters. It's written by Kurt Busiek who writes the Astro City stories that I like so much. Alex Ross does the artwork. 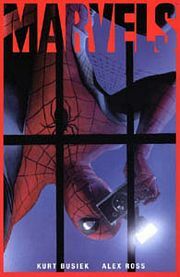 To be frank Alex Ross could make a comic book without words and I would buy it. His watercolors are so photorealistic it brings the thought of a superhero to life. Busiek takes his usual approach which I didn't realize until I read this. Most writers write about the story from the superhero's perspective. You hear the superhero's thoughts and words and see their actions. Busiek typically doesn't do this. His superheroes are distant and seen but not heard. The stories take place in the head of a regular joe. In this case a freelance photographer. It provides a more humanistic story yet one which helps make the superheroes more awe inspiring. A little more untouchable. He follows some of the more famous Marvel character from the time he starts freelancing to when he's an older man. And providing a different take on these characters than you'd normally expect. 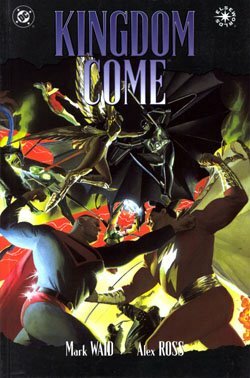 And finally I'll recommend Kingdom Come which was recommended to me by one of my readers. Again it's Alex Ross on point for the graphics. You might want to wait as I'm hearing rumors that an Absolute version of this book will come out soon. Absolute version are bigger and much more impressive to read and view. They are the only way to view Ross' work. Mark Waid is the writer and undertakes a story of an alternative DC universe where the superheroes we know are getting old and retiring and the new superheroes don't quite have the same moral compass. It reminded me of Watchmen (I keep hearing this is being made into a movie) in some ways. I almost get the feeling that the story is almost a suggestion to current day comic writers that their characters have lost their compass (he's probably thinking specifically of Frank Miller). They're perhaps a little too gritty and sullied and should be lightened up somewhat. Overall it's very well done.